Left brain, right brain, pug brain. : Queen of everything. Last night, I was in super-wife mode. Not only did I whip out a crazy new recipe for dinner, but I even remembered to wear my "Queen of everything" apron whilst cooking (don't worry, it was a wedding shower gift. I don't refer to myself as the queen of anything...except maybe ice cream consumption). Plus, I got to use our new food processor again. Yeah. It was a good night. What is this vision of deliciousness, you ask? 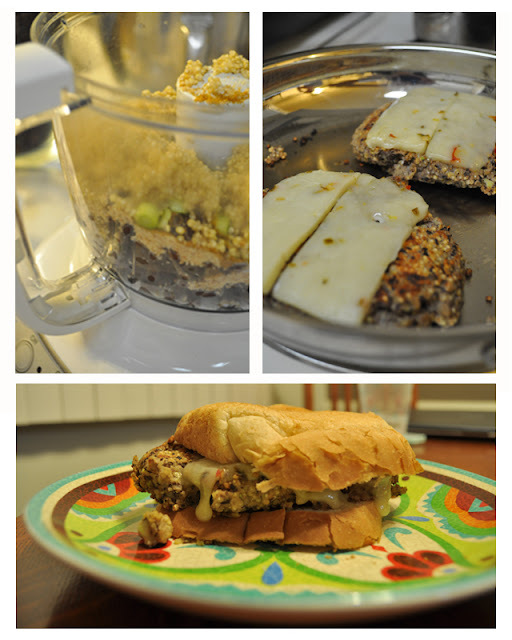 They're loaded quinoa burgers and they are YUMMY. We're starting to figure out which protein-packed grains/seeds/plants we like best in lieu of meat (lentils = bad; quinoa, cous cous, seitan = good) and these are definitely keepers.